A project about moving away from home. Being Abroad is a collection of personal stories about relocating to a foreign country. It aspires to sidestep traditional styles of travel writing and focus instead on the emotional aspects and consequences of living abroad. Read the essays or browse the sketchbooks. The project was conceived in 2005 when, within weeks of moving abroad, Lucy and Russell met and discovered a mutual desire to discuss their respective experiences. Lucy spent two very different summers working in Europe with other foreign students. Her first experience of living abroad sparked an interest in people’s varying responses to moving away from familiarity and using distance to assess one’s life from a new perspective, and also how inclusion in another culture can highlight one’s own cultural identity or lack thereof. Russell decided on a whim to quit his job, sell his belongings and leave the UK for Copenhagen—a place he had never visited before—where he cofounded the digital agency Spoiled Milk and bought a second-hand bicycle. The first year was a joyous period of discovery and adventure, but also highlighted a lack of roots and belonging, along with an unwanted sadness at how easy it was to let go of his homeland. The original project website launched in the autumn of 2006, outlining the aims and inviting people to submit essays on their experiences. A few months later, the Sketchbook Challenge was set-up to allow participants more creative control over their entries, and 10 sketchbooks were sent to 100 people around the world. Four were lost along the way, the rest made it home. The initial idea was to produce a series of handmade books from the best material, but things went awry. Lucy and Russell moved again—this time together to Zurich, Switzerland—and Being Abroad became postponed. Several years passed somehow, there was a further move to San Francisco, and the postponement very nearly became terminal. A few months ago we finally started work on a website to showcase the best of the written submissions, and document the sketchbook contents. Where you are now is the result. To our contributors, sorry for not managing this sooner. To everyone else, we hope you enjoy the results. 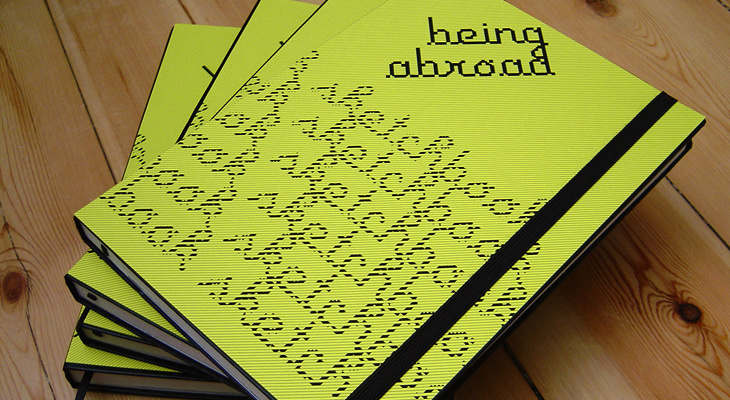 “The Being Abroad project exists to produce an alternative and intimate collection of material about the experience of foreign travel and relocation. We want to explore people’s circumstances, motivations for and expectations of emigration, along with the resulting experiences of life abroad; from the feelings of isolation an alien culture and environment can create, to the exploration it inspires—introspective or otherwise. Being Abroad is a project by Russell Quinn and Lucy Reynell. All work is copyright the contributors.